This month there was an exchange between the Dutch Air Force 311 Squadron based at Volkel AB, flying the F-104G and the Royal Air Force 5 Squadron based at Binbrook flying the Lightning. 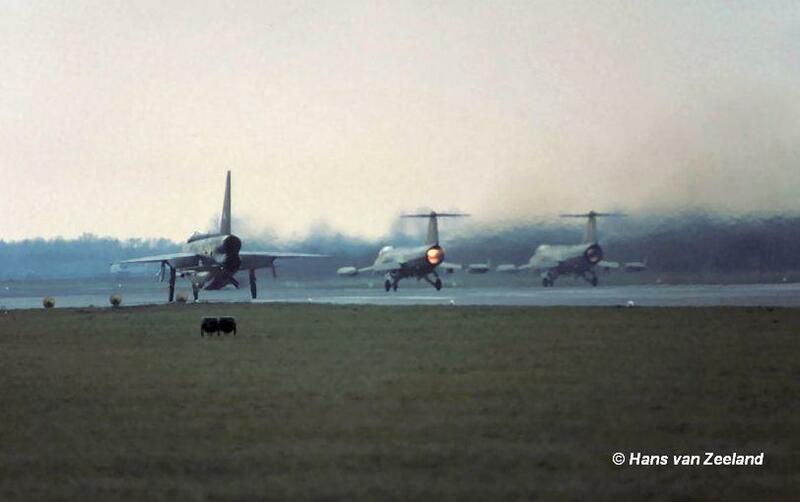 It was a 2 way exchange where four Lightnings came to Volkel AB, one of them was replaced by another Lightning on the 24th. 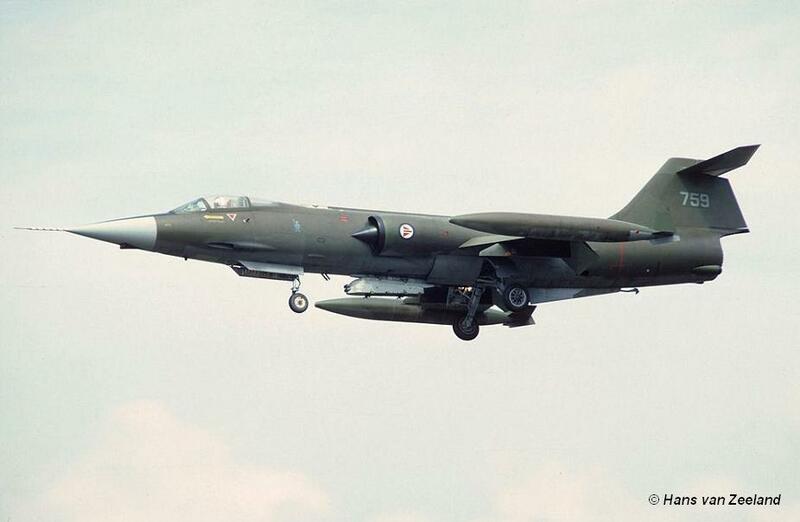 On March 21st six Dutch aircraft flew to Binbrook being D-8047, D-8048, D-8244, D-8257, D-8258 and D-8266. Two aircraft (D-8257 and D-8258) received 5 Squadron markings on their tails. 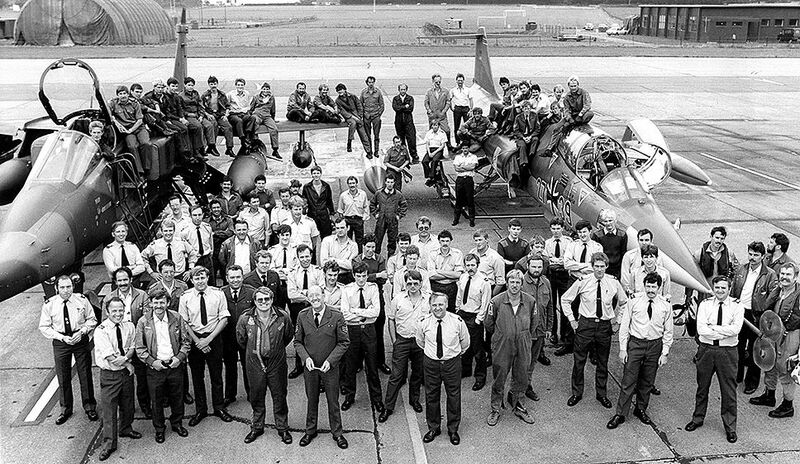 Also one Lightning received 311 Squadron badges in return. 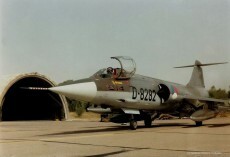 (Note: It is very likely that one of the Dutch Starfighters has been replaced by D-8022 at the end of the exchange since it was noticed on photographs) Beneath some photos, Line up of Dutch Starfighters and English Lightnings at Binbrook. Note the 5 Squadron markings on the tail of two Starfighters. 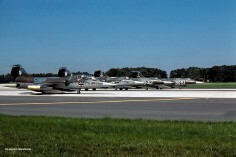 Aircraft in front are D-8022 and D-8047. 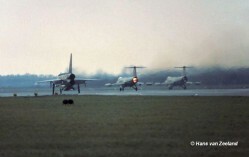 (Photo: Documentatie Group Volkel Typhoon), Photo taken at Volkel Air Base showing one Lightning fighter together with two Starfighters just before the break.. (Hans van Zeeland) and finally Photo taken at Volkel Air Base showing one Lightning fighter together with two Starfighters on the runway. (Hans van Zeeland). 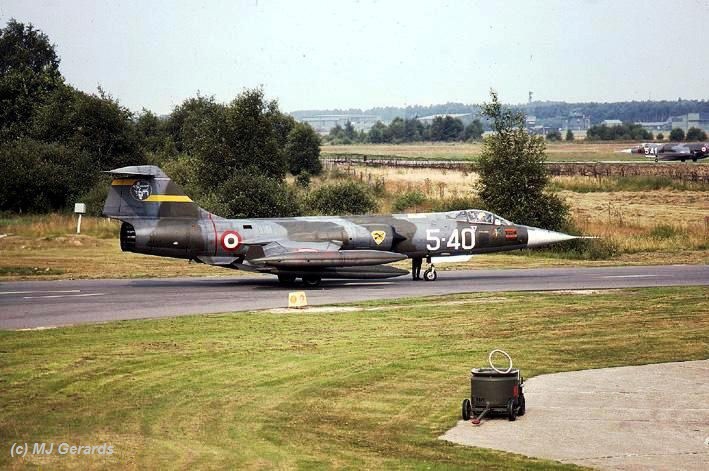 This month the Belgium Air Force 350 Squadron (1 Wing) based at Beauvechain AB, flying the F-104G, exchanged with Italian Air Force 9 Gruppo based at Grosseto flying the F-104S. It is unknown if it was a 1 or a 2 way exchange but at least four Italian Starfighters flew to Belgium. 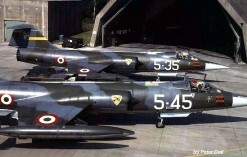 One of them was F-104S MM6809 code 4-5 as can be seen on the photo beneath thanks to Serge Bonfond. 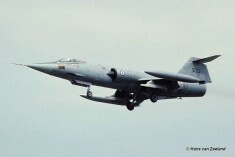 This year a squadron exchange took place between the Dutch Air Force 306 Squadron, based at Volkel AB flying the RF-104G and Portugese Air Force (Força Aérea Portuguesa) Esquadro 103 based at Monte Real AB flying the T-33A. 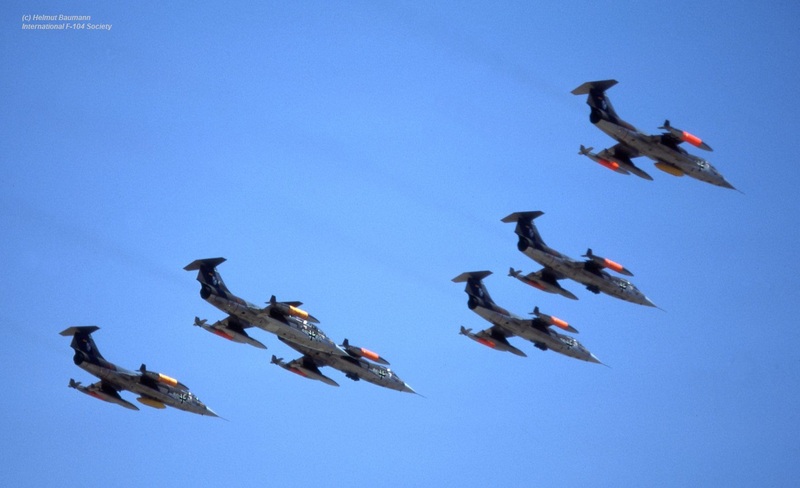 It was a 1-way exchange where Dutch Starfighters flew to Portugal. 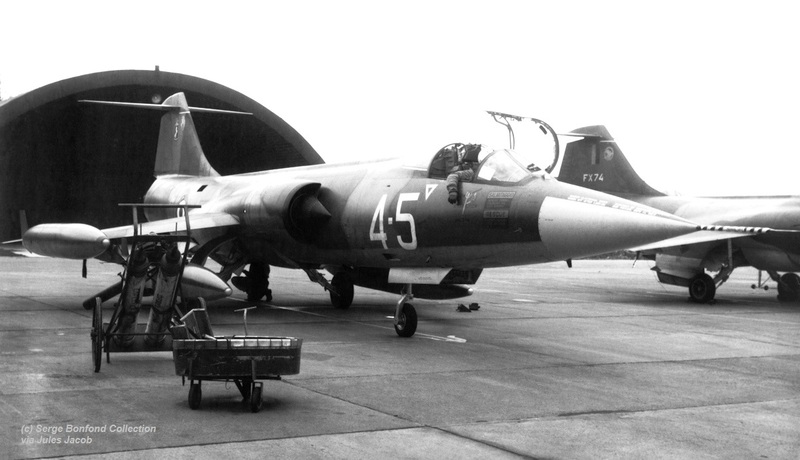 The aircraft were D-8107, D-8138, D-8273 and one unknown TF-104G. 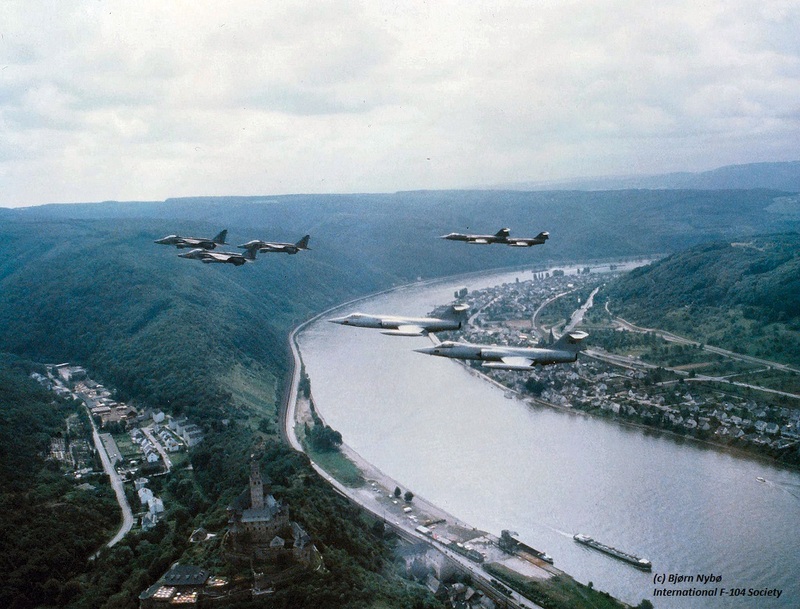 Transport was flown by Fokker F-27M Troopships from 334 Squadron (C-6, C-8, C-11, C-12). 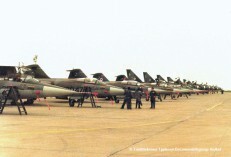 The starfighters flew to Portugal via Istres AB in France where they made a fuelstop. 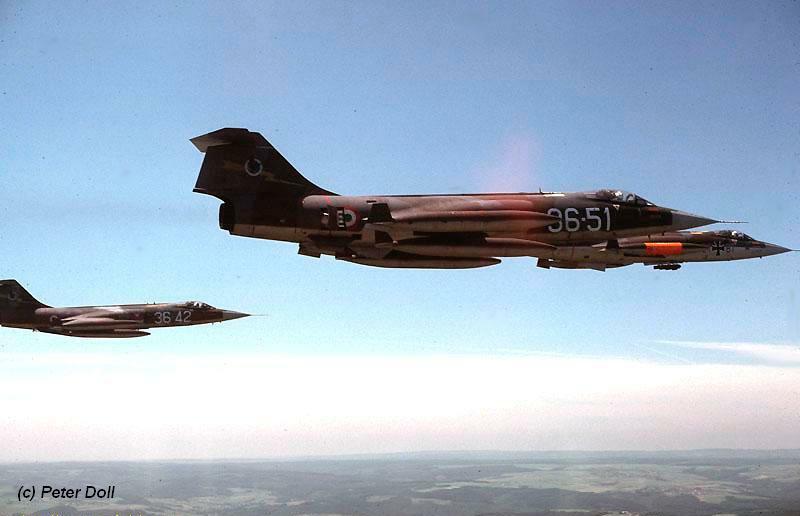 This month there was an exchange between the USAFE 50 TFW based at Hahn AB, flying the F-4E Phantom and the Italian Air Force 21 Gruppo based at Cameri AB flying the F-104S. 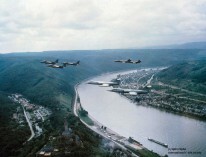 It is unknown if it was a one or 2 way exchange but at least thee Starfighters flew to Germany. Sadly the serials are unknown. 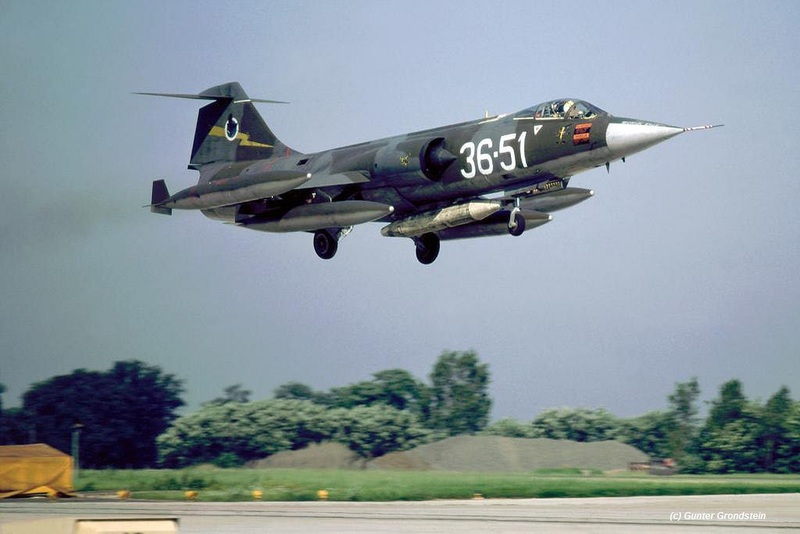 This month the Danish Air Force 723 Eskadrille based at Aalborg AB, flying the F-104G, exchanged with Italian Air Force 22 Gruppo based at Istrana flying the F-104S. It was a 2 way exchange. 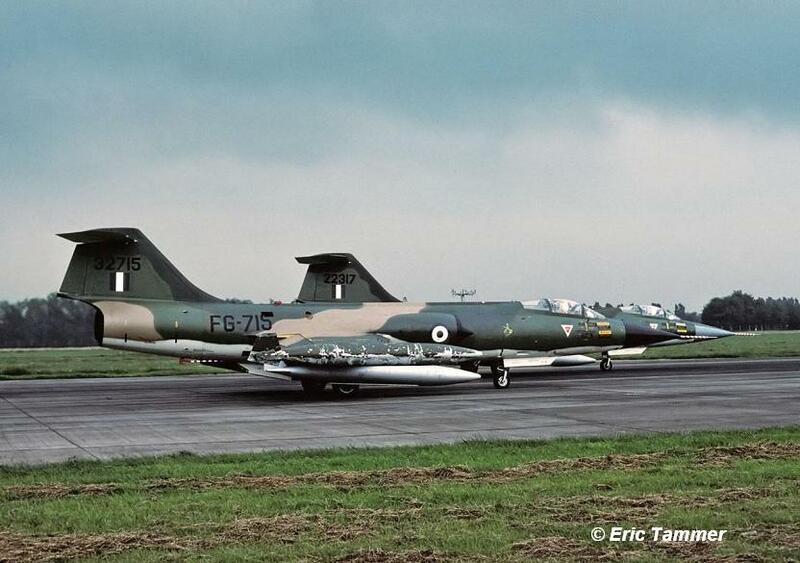 Four Danish Starfighters flew to Istrana being F-104G R-341, R-645, +unknown and CF-104D RT-654. 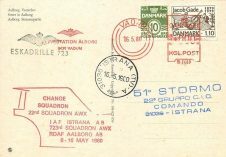 Postcard beneath was found on Ebay. 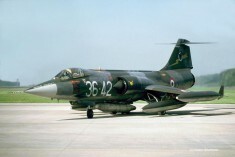 This period there was an exchange between the Dutch Air Force 322/323 (645 composite) Squadron based at Leeuwarden AB, flying the F-104G, and the Belgium Air Force 1 Escadrille based at Bierset flying the Mirage 5BA. It was a 2 way rotation. 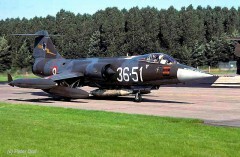 Four Mirage aircraft arrived at Leeuwarden the 28th of May. This month MFG2 based at Eggebek, Germany, flying the Starfighter, exchanged with French Navy squadron 11F based at Landivisiau flying the Super Etendard. 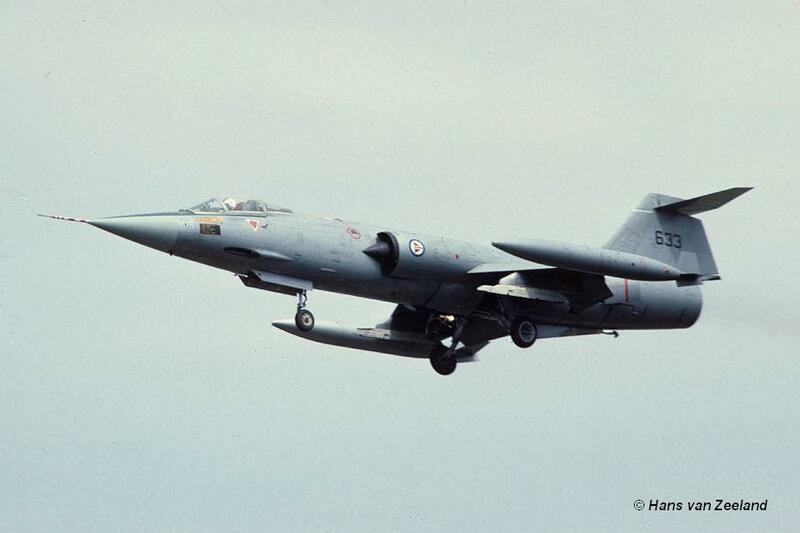 It was a 1 way rotation where four RF-104G recce Starfighters flew to France. This month a squadron exchange took place between Hellenic Air Force 336 Mira "Olympus" from Araxos AB, flying the F-104G, with the Dutch Air Force 312 Squadron at Volkel AB flying also the F-104G. 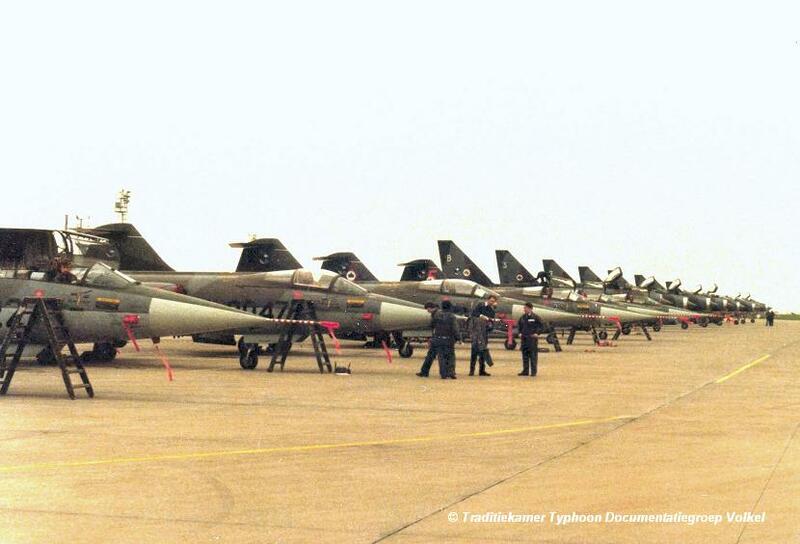 Four Greek Starfighters came to Volkel but did not fly much mainly due to the weather conditions. On July 4th only two Greek Starfighters flew a mission and on July 7th all Greek Starfighters flew a mission and that was it.. Participating aircraft at Volkel were TF-104G 62-12278/TF-278 and F-104Gs 62-12317/FG-317, 63-12715/FG-715 and 63-12720/FG-720. On June 19th the TF-104G 62-12278 visited Volkel AB for a pre-visit and stayed the night. 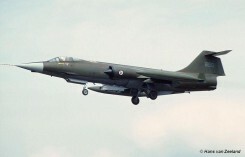 The Dutch Starfighters which flew to Greece were D-6668, D-6681, D-8063, D-8282, D-8308 and two seater D-5807. 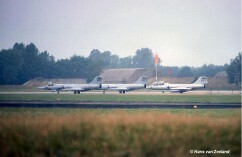 Beneath a photo taken by Eric Tammer of Aircraft FG-715 and FG-317 lining up on the runway of Volkel Air Base on July 7th. Another photo shows 63-12715 landing at Volkel. Also two photos taken at Araxos (thanks to Andreas Staveris Polikalas). 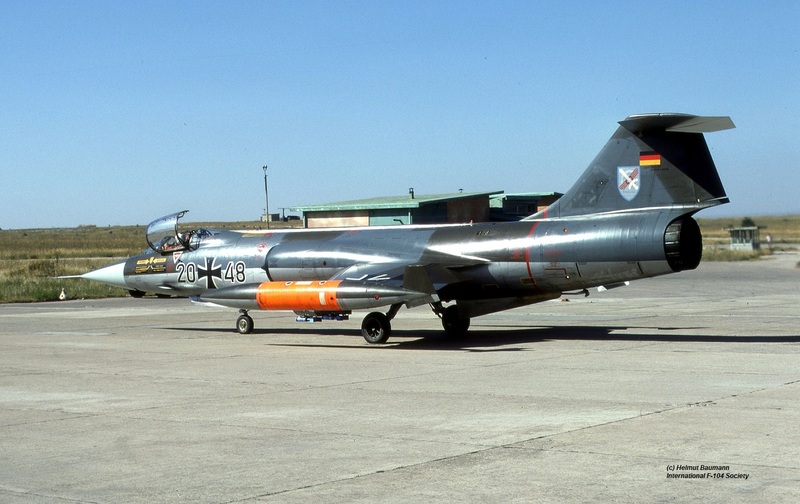 This month there was an exchange between the German Air Force JBG31 (1st Staffel) based at Norvenich AB, flying the F-104G and the Italian Air Force 156 Gruppo based at Gioia del Colle AB flying the F-104S. 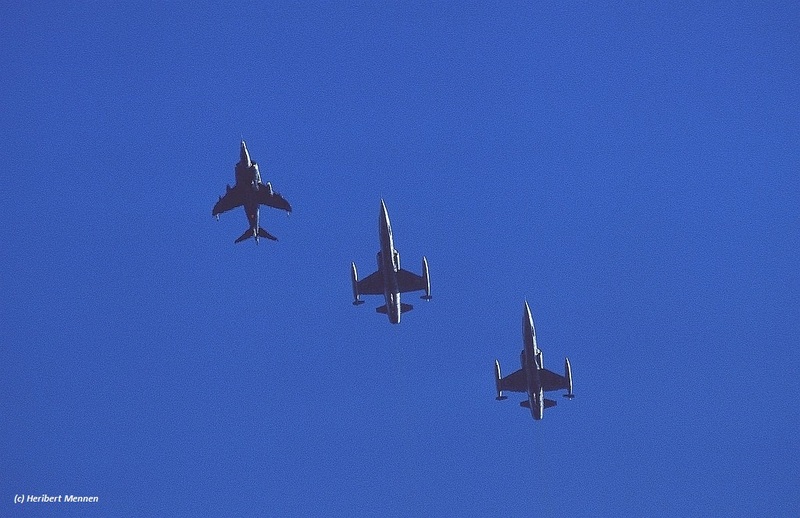 It was a 2 way exchange where four Italian Starfighters flew to Germany being MM6747/36-37, MM6789/36-42, MM6909/36-51 and MM6838/36-55. Beneath some photos. 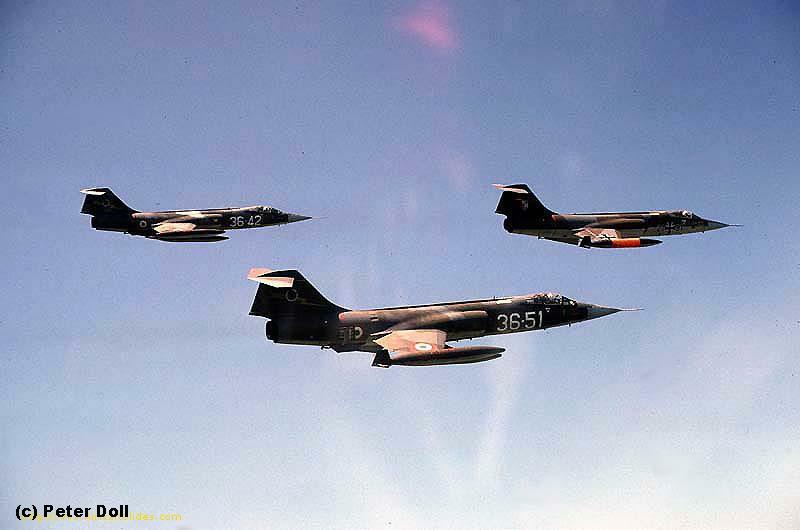 First thee (thanks to Peter Doll) show Italian Starfighters MM6909/36-51 and MM6789/36-42 flying formation with one of the Norvenich Starfighters over the Eiffel area. 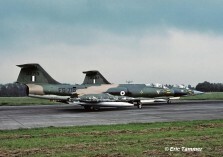 And also a photo showing F-104S MM6909/36-51 taxying at Norvenich. 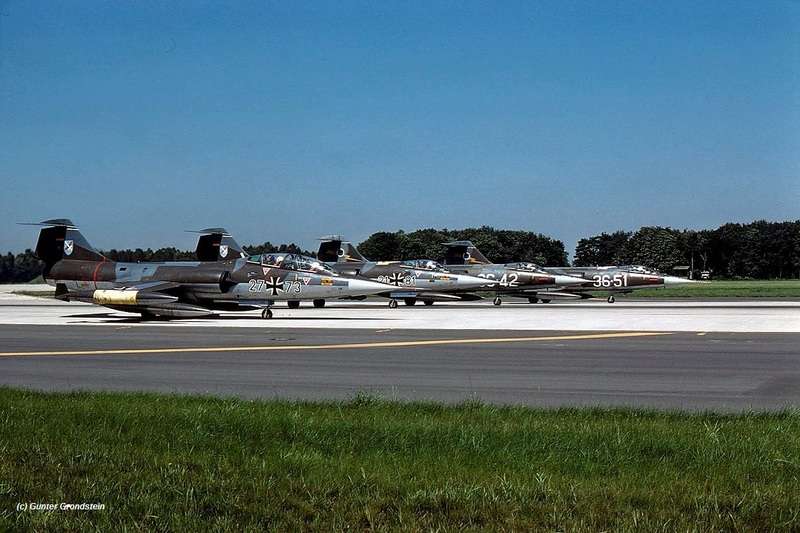 Next three photos (thanks to Gunter Grondstein, taken on July 23rd) show a nice line up of two German and two Italian Starfighters, a landing shot of the F-104S MM6909/36-51 and finally a taxy shot of F-104S MM6789/36-42. 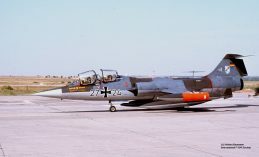 The German aircraft seen at Gioia were F-104Gs 20+48, 23+40, 23+74, 24+03, 26+30 and TF-104G 27+24. The Commander was Staffel kapitän (Squadron Leader) Major Jertz. 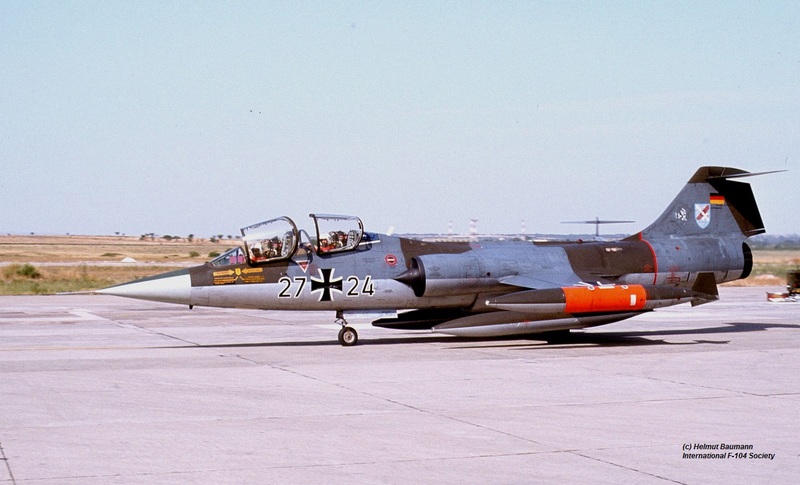 In Italy, on July 17th, Hptm Burmann and HFw Reifenrath planned a TF-104G trip to the Etna. During the take-off they encountered a bird hit and they had to break off the start….entering the cable with the hook. Everything finished ok. After the technicians had checked the aircraft carefully the aircraft was soon declared OK again and the two German pilots could again take off for the Etna. Beneath also three photos of German aircraft taken at Gioia by Helmut Baumann. It shows 20+48 and 27+24 taxying at Gioia and also a nice fly farewell photo taken during the departure of all aircraft back to Germany. 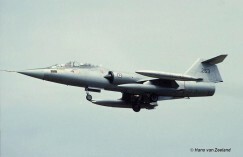 This month 23 Gruppo from Rimini, Italy exchanged with RAF 19 Squadron based at Wildenrath and operating the Phantom FGR.2. 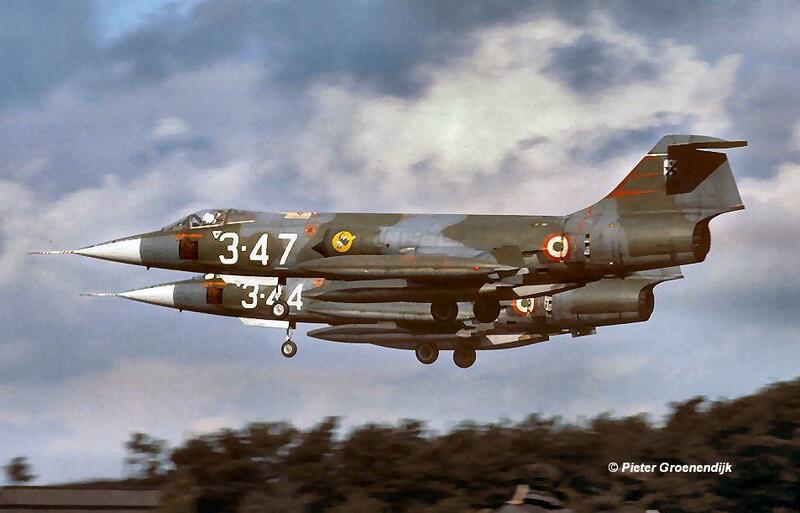 It was a 2 way exchange where at least four Italian aircraft were seen at Wildenrath being MM6942/5-35, MM6805/5-40, MM6714/5-41 and MM6767/5-45. On July 4th two F-104S aircraft made a pre-visit. They were MM6792/5-15 and MM6942/5-35. 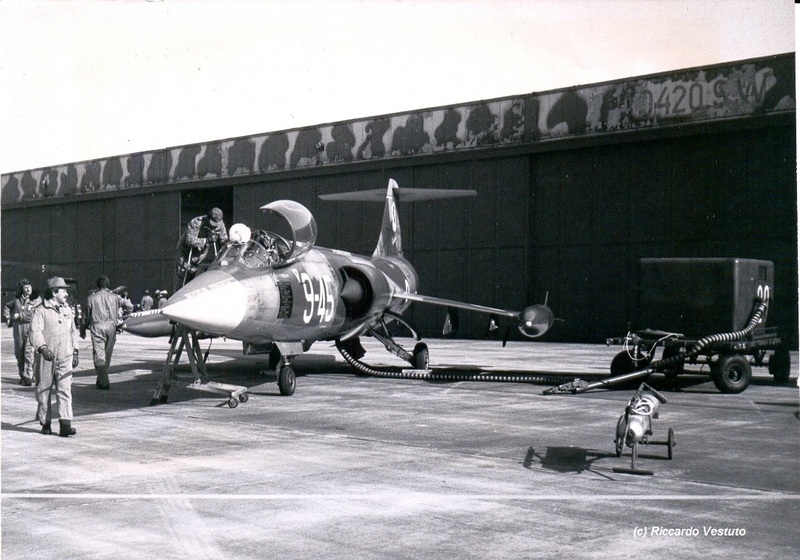 Beneath a photo showing MM6942 code 5-35 and MM6767 code 5-45 in front of a shelter at Wildenrath (by Peter Doll) and a photo showing the 5-40 taxying out for another mission following 5-41 seen in the background (by MJ Gerards). AMI Support on the 18th July was done by C-130H MM61994/46-08 of Gruppo 50. 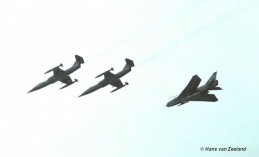 The Phantoms flew to Rimini also on the 18th of July. This month the Royal Air Force 15 Squadron based at Laarbruch, Germany, flying the Buccaneer S.2B, exchanged with German Air Force JBG32 (1st Staffel) based at Lechfeld flying the F-104G. 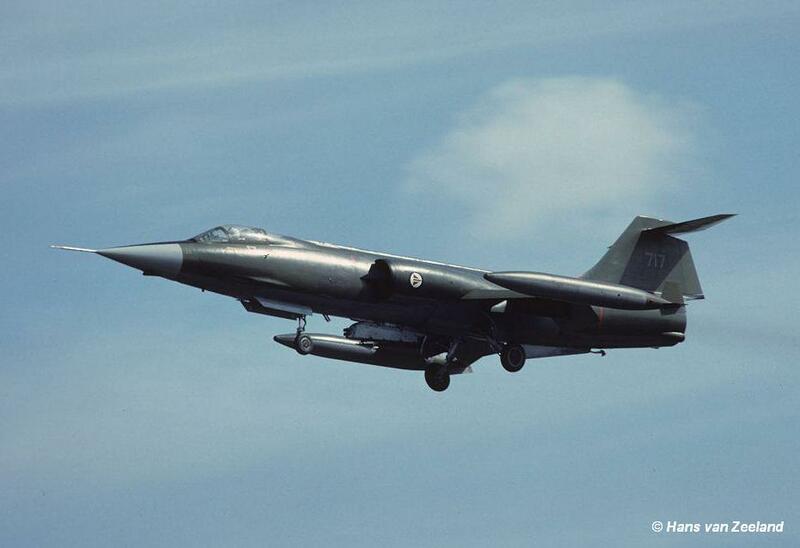 It was a one-way exchange, no F-104G to Laarbruch. 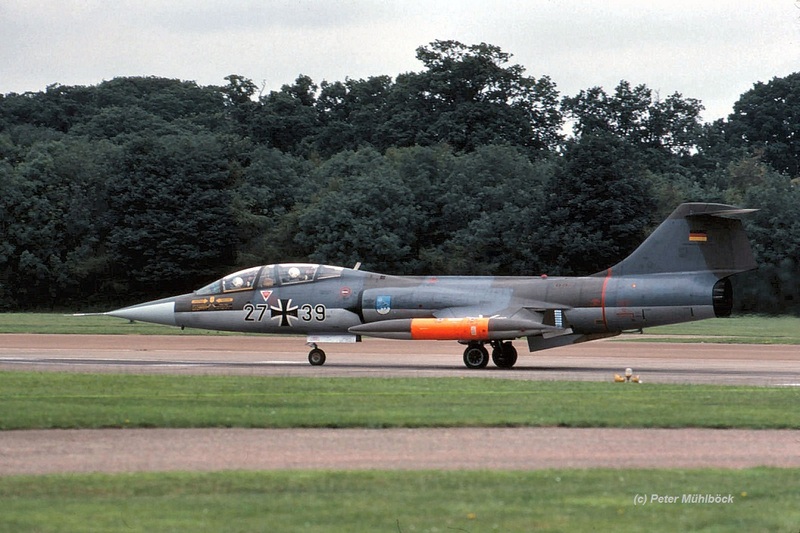 This period MFG1 based at Schleswig Jagel, Germany, flying the Starfighter, exchanged with Royal Air Force 29 Squadron based at Coningsby flying the Phantom FGR.2. It was a 2 way exchange where five F-104G Starfighters flew to the UK and the Royal Air Force brought five Phantoms to Germany as well. 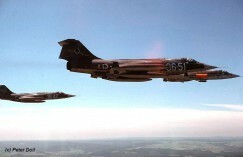 This month the Canadian Air Force 439 Squadron based at Baden-Sollingen AB, flying the CF-104 exchanged with the Danish Air Force 725 Eskadrille at Karup flying the F-35 Draken. It was a shifted exchange where the Drakens first were flying from Sollingen from June 13th with 5 aircraft and the Canadians flew to Denmark in September with 8 Starfighters. 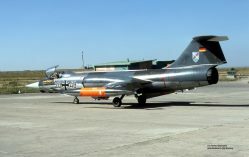 This month 155 Gruppo from Istrana, Italy exchanged with the Belgium 23 Smaldeel (10 Wing) at Kleine Brogel AB still flying the F-104G. 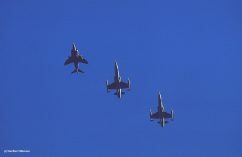 Italian aircraft seen at Kleine Brogel on the 14th of October were : MM6837/51-32, MM6749/51-41, MM6835/51-42 and MM6944/51-55. It was a two way exchange, sadly the serials of the Belgium Starfighters at Istrana are unknown. 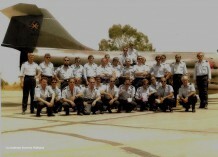 In September 1980 the Dutch Air Force 316 Squadron at Gilze Rijen AFB paid a visit to Villafranca with a number of NF-5 aircraft. 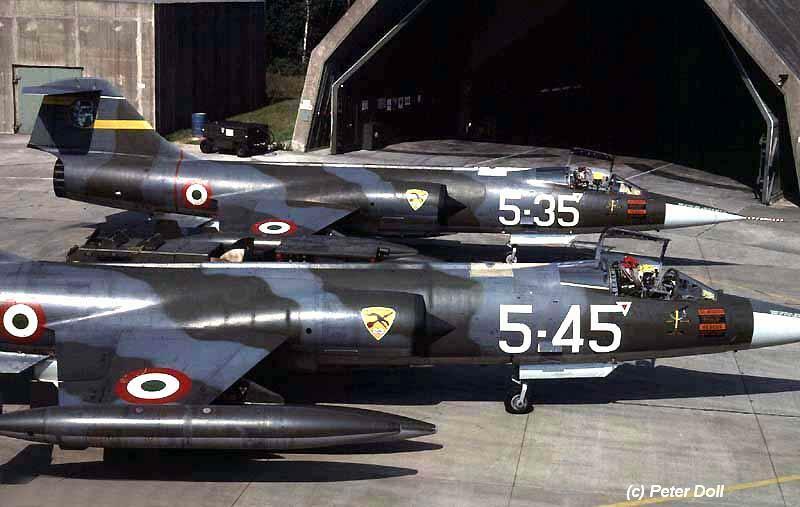 In October 1980 the Italians from 28 Gruppo paid a visit back to Gilze Rijen with four Starfighters being MM6504/3-44, MM6535/3-47, MM6582/3-35 and MM6595/3-36. All together this makes it a 2-way delayed exchange. Beneath a photo by Pieter Groenendijk showing 3-47 and 3-44 landing at Gilze in October and a photo showing the MM6595/3-36 during take off. 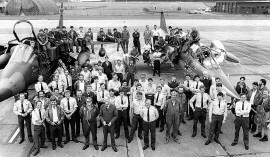 This period 154 Gruppo from Ghedi, Italy exchanged with RAF 3 Squadron based at Gutersloh flying the Harrier GR3 aircraft. 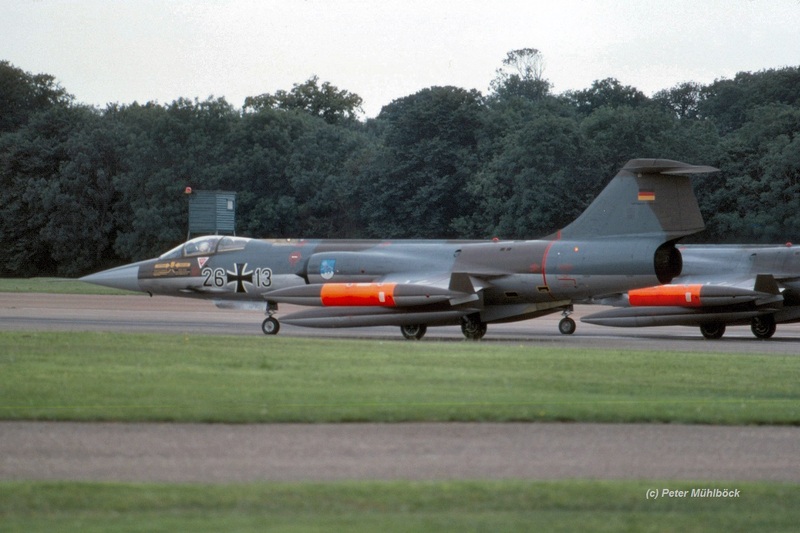 At this RAF airbase in Germany the Italians participated with 4 aircraft : MM6532/6-03, MM6559/6-06, MM6546/6-10 and MM6558/6-24. 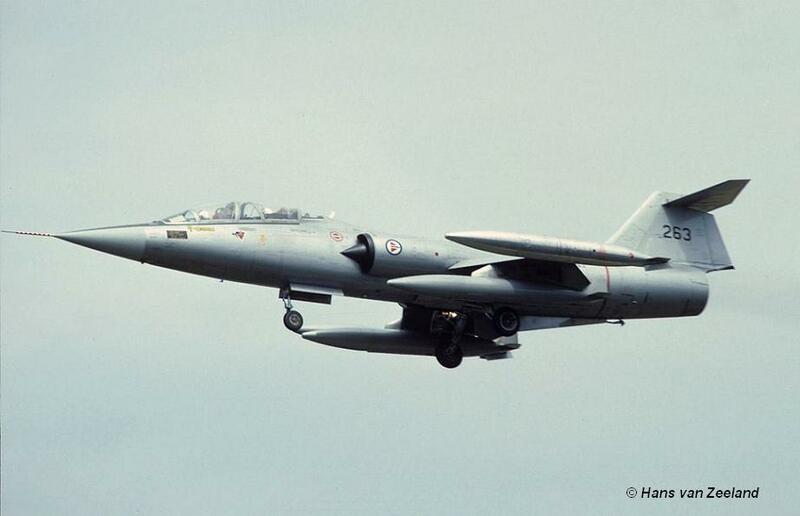 It is unknown if the RAF aircraft also flew to Italy. Beneath a photo taken at October 28th showing MM6559 code 6-06 and MM6532 code 6-03 over Gutersloh with one of the based Harriers. 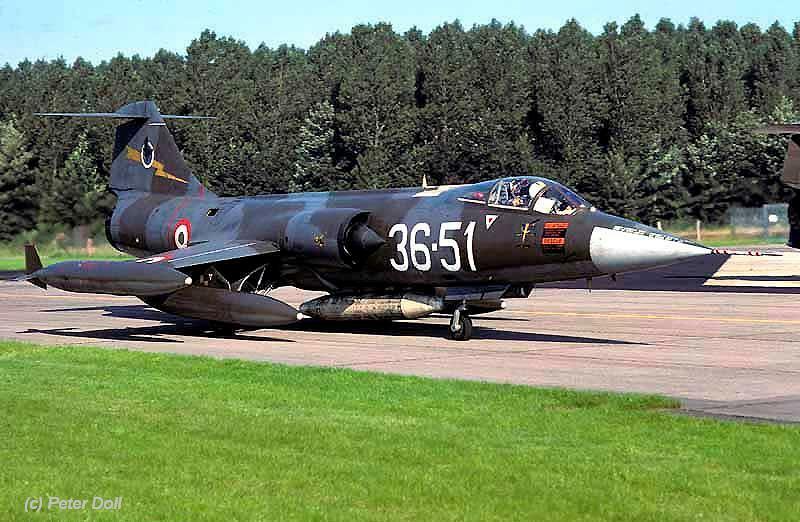 This month the Danish Air Force 726 Eskadrille based at Aalborg AB, flying the CF-104 and F-104G, exchanged with German Air Force JBG32 (2nd Staffel) based at Lechfeld flying the F-104G. 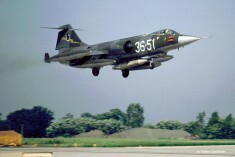 It was a two-way exchange where 6 Starfighters flew to Germany and 6 Starfighters to Denmark. 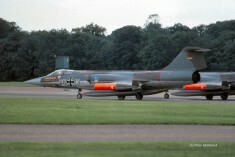 Aircraft participating at Lechfeld could be R-703, R-646, R-647 and RT-684 because these aircraft were all seen afterwards zapped with 2nd Staffel badges. 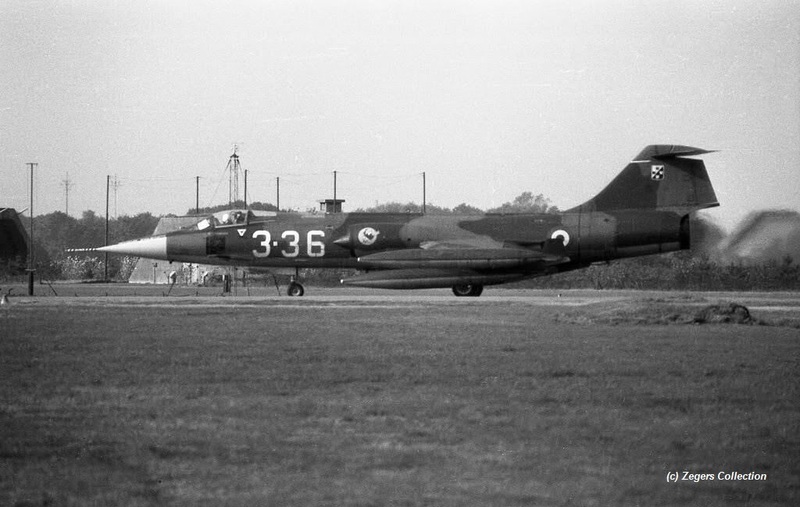 German aircraft at Aalborg are still unknown today. This year a squadron exchange took place between the French Air Force EC 1/3 and EC 2/3, both based at Nancy, flying the Mirage IIIE and the Italian Air Force 132 Gruppo, based at Villafranca flying the F-104G. It was most probably 2 way exchange but we still need confirmation. While both EC 1/3 and EC 2/3 were involved, it is unknown which unit went to Villafranca and which unit hosted 132 Gruppo in Nancy.